It's hump day, friends! Halfway through the week! 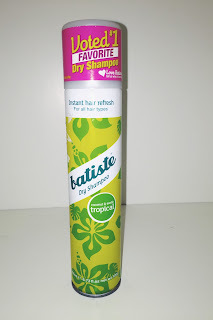 I'm on day 4 with my hair thanks to the AMAZING Batiste dry shampoo! You can get it on Amazon for $10 or retail stores like TJmaxx and Marshalls. It's completely taken away any shine I've had in the mornings. I'm pretty proud that I've been able to last this long. I had the best intentions of dutch braiding my hair into a low messy bun but I just didn't have the energy to continue to try and try again. I'll save that project for another day and another time. :) I decided to stick with the top knot. Although it may seem simple making it look perfect and not look like a donut on your head or Mulan's hair do can be quite the challenge. I say make sure your hair is a little dirty. It helps hold the bun. If you try this with clean hair, I can almost guarantee it will end with disappointment because your hair will be too smooth. 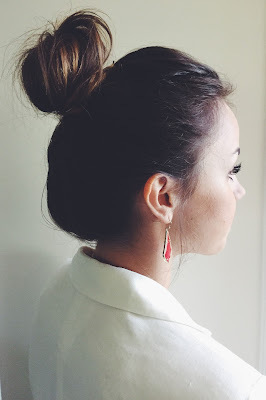 Follow these simple top knot steps below and share your results in the comments. 3. Brush hair into high ponytail making sure everything is slicked back to start. 4. Once hair is in ponytail create body by pulling out the front a little and making it a little messier. 5. Add bobby pins where you need them so it doesn't look like a rat's nest. This is a more polished look. 6. Take hair and wrap it around itself, playing with edges and making it a longer bun rather than rounder. 7. Perfect to your liking and TA DA! If you are still struggling with these instructions, I'd be happy to post a video.